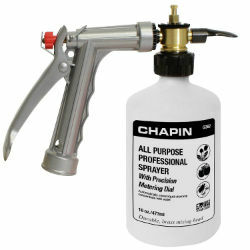 The Professional All Purpose sprayer fits onto any hose end and offers 16 mixing ratios, durable brass mixing head and sprays up to 100 gallons. A built-in anti-siphon feature prevents backflow. 3 simple steps: Fill, Set, Spray! It automatically mixes liquid concentrate with water.